At the time of this writing, many apps on the iOS App Store are powered by Realm. A lot of them are brand new and still relatively small, while some have already reached critical success, and others even exceeded that, earning Apple’s coveted ‘Essentials’ badge. This week, we’re proud to recognize a very prominent app, straight from Apple’s “Essentials” collection: Groupon! If you haven’t heard of it before, Groupon is a global service aimed at connecting users and merchants in the same area, letting users take advantage of special discounts and deals of merchants around them. 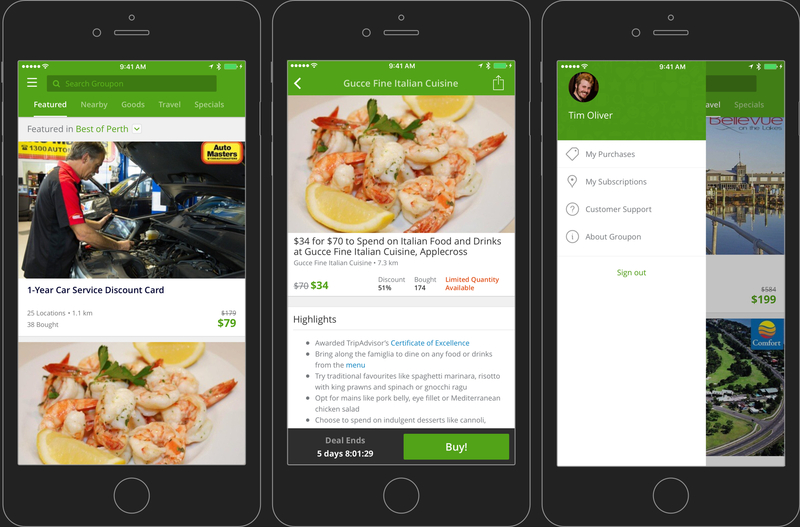 Merchants can advertise their products or services as separate discounted ‘coupons’ via the Groupon app that users can simply buy directly in the app. These coupons are then saved in the user’s account, and may be redeemed for their full value from the merchant at a later date. The model is both amazingly simple and effective. The discounted prices aren’t trivial, with certain products and services being advertised for 50% off or more. Even without buying anything from the app, it’s a great advertising channel for merchants to let users find out about them! Of course, if you hadn’t already guessed, we’re absolutely thrilled that the Groupon apps are powered by Realm. Groupon has been an early adopter of Realm, and we couldn’t be happier that it fit their scale requirements well. Also, while we have the chance, special recognition should also be given to Groupon for letting the Swift Language Users Group meetup periodically host events at their incredibly beautiful office in Palo Alto. From everyone at Realm, we thank Groupon for leveraging our tech in their fantastic, worldwide service (as well as allowing the use of their offices)! We wish them the very best in their endeavors, and will continue to support them in the future!